Motherwell and St Johnstone meet at Fir Park on Saturday as both teams grasp at the disappearing hope of a late dash into the top half of the table. A more realist appraisal suggests that this is the start of the contest for seventh place. Fortune has favoured the visiting team in this season's early encounters. 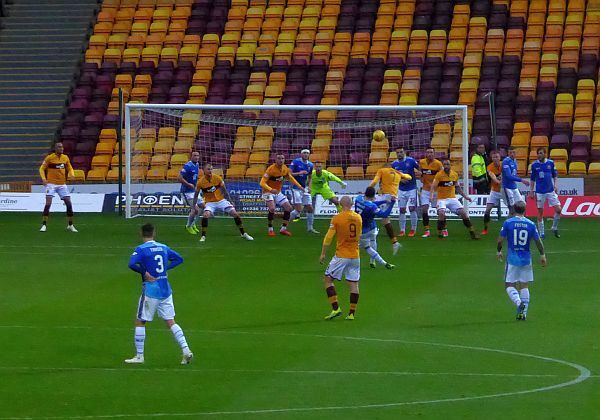 Jason Kerr scored the only goal in Octoberin added time at Fir Park while in December Tom Aldred and Danny Johnson found the net at McDiarmidto bring us a 2-1 win. Three Motherwell first team regulars were involved with the Scotland U21s over the international break while their team-mates had a mixture of rest and training. It will be important that the momentum gained in recent weeks is not lost with the lack of competition. St Johnstone managed to overcome St Mirren on Wednesday evening thanks to a Chris Kane goal. That ended a nine game slump (1 draw 8 losses) that saw them fall down the table. They now lead Motherwell by a point and occupy seventh place. Assuming the three young caps return with no ill effects from their trip to Spain Stephen Robinson will have the option of starting with the familiar eleven. But it may be that the off-colour performance at Easter Road in the last outing may lead to a shuffle. The teams are in the mid-table cruising zone. There is little prospect of a top six place above and the buffer of more than twenty points from the play-off spot below. The pressure should be off and a relaxed free flowing spectacle should be on show. Maybe not...0-0.